Adequate wastewater facilities are vital to a community’s prosperity. Staying on-line, continuously, to provide safe, clean water is a necessity. While the water produced by the treatment plant is clean, the air quality in the plant environment itself is often harsh to breathe, corrosive and even hazardous. Adding to these on-site challenges are the regulatory requirements for H2S and methane ventilation, as well as community concerns about residual plant noise and odor. 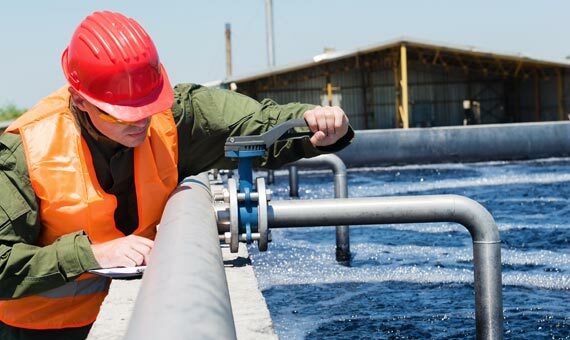 Together, these issues make air movement equipment performance and durability a mandatory requirement in the safe, continuous operation of a wastewater facility. And that’s Hartzell’s sweet spot – designing, manufacturing and applying the right solutions and products to perform against all of these challenges. We proactively leverage our creative design and savvy application expertise to provide products and solutions that combat your most pressing operational challenges. Noxious H2S and methane gases are hazardous to facility workers and surrounding communities. Facilities must control odor within the facility as well as the air released into the environment. Fans and blowers are integral to scrubber systems. System redundancy, electrical efficiency, and gas and odor control are a few wastewater regulatory compliance issues. Municipal operating budgets are thin, with little resources to cover unplanned or unexpected maintenance, repair or replace costs. Wastewater facility operators don’t want to have to think about their air movement equipment. They simply need to know it’s going to work as promised, with no performance inconsistencies or mechanical degradation due to environmental factors. This is not the place for light-weight fans. Our heavy-duty wastewater market products are specifically designed and manufactured to provide more durability, longer life and consistent air flow and acoustic performance day, after day, after day. Hartzell designed these featured products to withstand demanding wastewater facility applications.